On 18 July 2015, Islamic State (ISIS) authorities issued strict limitations on the use of satellite internet in Raqqa, Syria. It signals yet another move in ISIS’ efforts to control its information space. SalamaTech has tracked the digital war in Syria since 2012, including attempts by all parties to control and manipulate the Syrian information space. Here is what SalamaTech knows about ISIS’ latest gambit. What is the Islamic State trying to do? 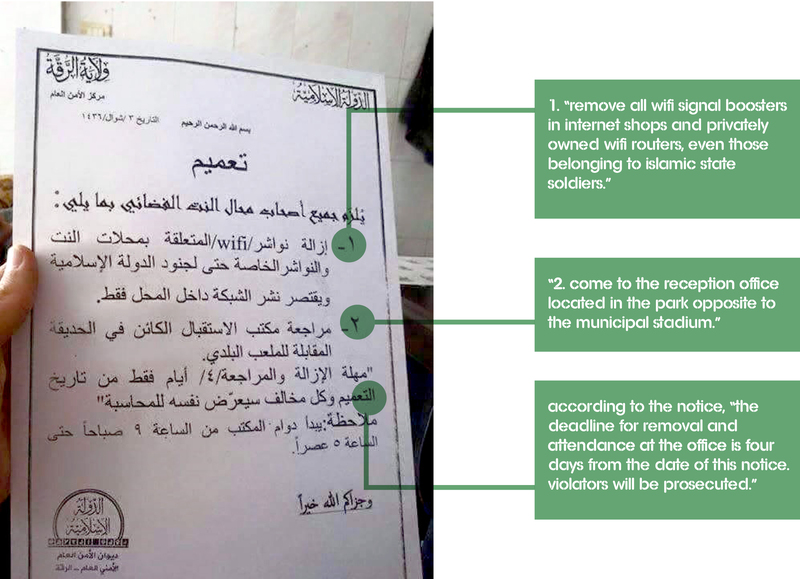 On 18 July 2015, the Islamic State Bureau of Public Security for Wilayat al Raqqa issued hand-printed notices in Raqqa, Syria1. Photos of the notice, detailing new restrictions on internet access, have circulated widely on social media. According to SalamaTech field sources in Deir Ezzor, similar notices have also reportedly been distributed in ISIS strongholds across the governorate. The order officially came into effect on 22 July 2015. The internet access economy in Raqqa and Deir Ezzor is uniquely concentrated on so-called “satellite internet shops.” This highly concentrated market provides ISIS with a clear path to controlling Raqqa’s and Deir Ezzor’s access to the outside world. Sale of internet access within a shop or cafe. Users purchase access to the shop’s wireless signal, often by the minute. Sale of internet access to locations in the areas around shops, usually by means of a signal booster that extends the range of a WiFi signal. According to anonymous sources in Raqqa, there are as many as 5,000 shop-based WiFi access points in the city as of July 2015. Internet access in any other form is almost non-existent – sources report that as much as 90 percent of all internet traffic from Raqqa depends on these shop access points. This high concentration of connectivity provides a prime opportunity for ISIS control of Raqqa’s connection to the outside world. How will ISIS enforce the internet ban? Internet users cannot browse in front of internet cafes, all browsing must be done inside the cafe. If the shop owner decides to accept women, he has to provide a separate space for them. The identity of all those connected via the satellite connection has to be recorded, including their personal identity information and the phone numbers they are calling. The number of people connected to the network has to be equal to the number of people inside the shop. It is forbidden to setup any router or booster outside of internet cafes. If the internet cafe owner decides to close the business, he has to report to the Islamic State security office and explain the reasons for closing the business. Although these measures do not appear to be enforced uniformly, on 4 August 2015, RBSS reported that four people were imprisoned in a cage in the downtown core of Raqqa City because they did not adhere to the WiFi ban. According to an anonymous source from Deir Ezzor, the ban has also reportedly been enforced in the city of BouKamal, and ISIS fighters physically removed the WiFi booster of one of the neighbourhood’s internet cafes. Why is ISIS restricting internet access? To intimidate and silence activists (or ordinary citizens) opposed to their rule, and prevent the circulation of unfavourable news or images to the outside world. It is important to understand the new restrictions as part of a broader campaign to organize and control information in the self-proclaimed Islamic Caliphate. There are indications that ISIS leadership is taking greater interest in shaping the information environment, preventing its fighters from releasing sensitive information or harming the organization’s public persona. ISIS leadership has issued guidelines to its fighting force on how to avoid exposing information on social media that would help foreign intelligence agencies. Al-Baghdadi, the leader of ISIS, has also placed new restrictions on execution footage released by ISIS-aligned media outlets, requiring them not to show the moment a victim is beheaded – only the moments before and after. These and other recent moves by ISIS leadership suggest that they are more sensitive than ever to the risks of uncontrolled internet activity. The ban on internet access in Raqqa and Deir Ezzor is a more practical, less abstract example of ISIS’ efforts to control the information environment. so-called Arab Spring, ISIS leadership is acutely aware of the massive disruptive potential of a permissive information environment. What does this mean for non-violent Syrian actors? If ISIS does somehow manage to sustain its efforts to police internet access, it will significantly limit the already debilitated ability of activists, civil society actors and citizen journalists to communicate with the world and provide evidence of ISIS atrocities. This limitation is not a novel one. For over four years, Syrian activists have been operating under increasingly hostile circumstances while they attempt to report the mass violations they have been witnessing on a daily basis. Syrian activists have faced harsh crackdown measures, torture and death by not only the Assad regime but, more recently, ISIS as well. Field sources and news reports from Raqqa and Deir Ezzor confirm that ISIS is extremely intolerant of activists who use their smartphones to document ISIS atrocities in their communities, and subsequently use the internet to channel documentation and evidence to interlocutors in the outside world. Restricting access to internet is one way ISIS hopes to stamp out dissent. An anonymous source from Deir Ezzor estimates that 80% of activists who were executed by ISIS were detained because of incriminating evidence found on their smartphones. Similarly, in Raqqa several reports indicate that activists are being executed based on allegations that they are conspiring with Western entities and spying on ISIS – the internet being the main medium through which information is channelled. The non-violent activists of Raqqa, Deir Ezzor – and Syria more broadly – already struggle to be heard by the increasingly deafened international community. As ISIS and the Syrian regime escalate their measures to control Syria’s information space, it is those crucial Syrian voices that resist violence, call for peace and document war crimes that will be ever more silenced.